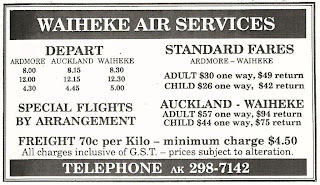 Rex Air Charter pioneered a land-based air service between Ardmore and Waiheke Island in 1975. The service was later developed to include an on demand stop at Auckland International Airport (http://3rdlevelnz.blogspot.com/2011/04/rex-air-charter-waiheke-island-service.html). On the 15th of March 1976 this company was bought out by Dalhoff and King Aviation Ltd who, in turn, were bought out by Motor Holdings (Aviation) Ltd on the 7th of December 1981. The air service, however, continued to operate under the well-known Rex Air Charter banner. 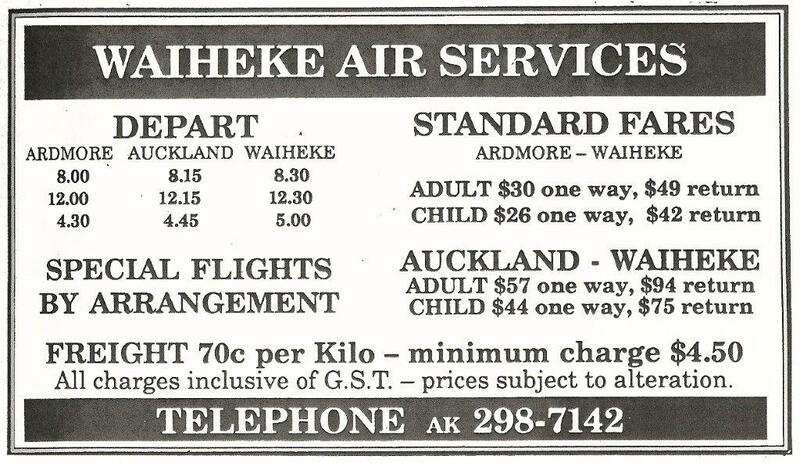 On the 1st of June 1986 the air service was rebranded with the trading name Waiheke Air Services while remaining part of Motor Holdings (Air Services) Ltd, a subsidiary of the Motor Holdings Ltd transport group. The airline's manager, Brian Sutherland told the Gulf News “the name change is intended to provide a stronger identity for the service provided. In choosing this name we clearly show our commitment to serving the island's air transport needs for the future." 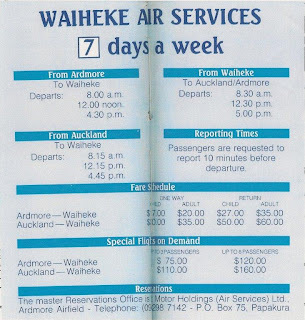 Throughout the years Waiheke Air Services continued their normal timetable of three flights a day between Ardmore and Waiheke Island’s Stonyridge airfield at Onetangi using single engine Cessna aircraft. The company’s lease of the Stonyridge airfield was such that no-one, not even the land owners, could use the airstrip. Ownership of Motor Holdings and the air service passed to Flightline Aviation Ltd on the 24th of July 1992 and soon after negotiations began to open the Stonyridge airfield to other users. In late October, Flightline Aviation announced the air service to Waiheke Island flight would change to an on-demand service from the 2nd of November 1992. With the Stonyridge airfield being opened to other users Great Barrier Airlines immediately announced their intention to start flights to Waiheke and the 17 year old Rex Air Charter/Waiheke Air Services Ardmore-Waiheke service passed into history. 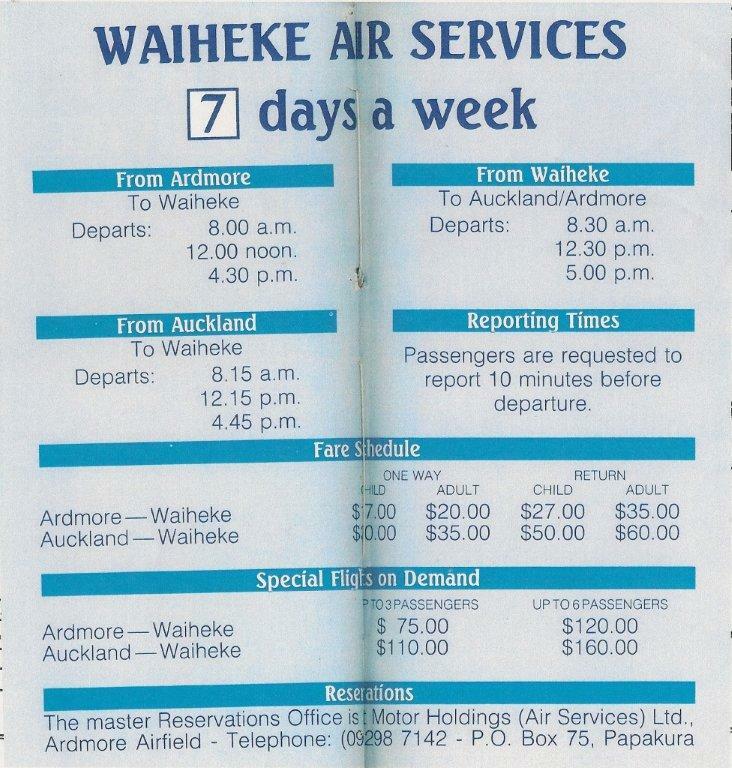 In subsequent years Waiheke Island was served by two different operators with similar names, Waiheke Airservices and Waiheke Air. These were not connected with Waiheke Air Services and will be the subject of future posts. New parent company - new logo and look. Flightline Aviation's Cessna 172N Skyhawk II ZK-ELF taken at Ardmore on the 24th of January 1992, a few months before they took over Waiheke Air Services.